Hong Kong Disneyland Fantasyland is exactly what it is named. Talking about stepping into your childhood dreams, this is where everyone MUST see, no matter how old you are. Most of the classic Disney theme attractions and characters are here, such as Mickey Mouse, Donald Duck, Dumbo, Winnie the Pooh and Friends and many more. After getting off the train, we spent quite a lot of time in lining up to take pictures with all the Disney characters. You can actually expect to meet the characters anywhere in the theme park. Of course, you can only meet the most popular ones in person by lining up. It could take from 15-45 minutes. 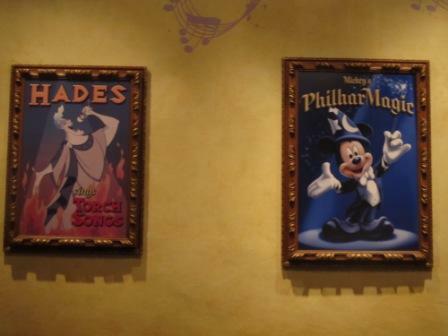 Disneyland Hong Kong tries to sell you pictures whenever and wherever they can be. So is taking the pictures with your favorite characters. The staff still helped us to hold our cameras to take pictures. But it wasn't as great as those they tried to sell us. Another theme park, Ocean Park Hong Kong works the same in this way when it comes to picture taking. To line up, pick the pictures and pay for them cost us at least another 15 minutes. Just on this activity, it cost us an hour right there. Therefore, a good planning is very important. My little one dragged all the adults into this while Perry and I were having fun in the Space Mountain. 'Cos the 3-year-old didn't meet the height limit. This looks like a typical carousel anywhere in the world. No limitation of height. Each "horse" has a seat belt which is great. My sister stood next to my son's horse while the carousel was spinning. With the seat belt buckled on the little child, it was easy for her to take care of both the kid and herself. My son loves horses so much. To him, this is a MUST. 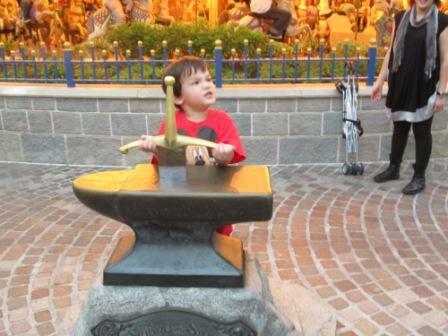 Pull, pull...harder...Will you be the next King Arthur? Have you heard of a story about little King Arthur? It is right next to the Cinderella Carousel. It is a great spot for taking a memorable picture. 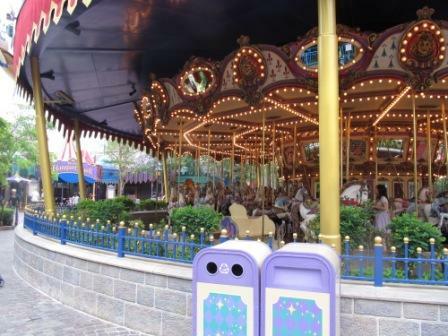 If you knew about the story, you can imagine how this (Hong Kong Disneyland Fantasyland) attraction would be like. For adults, it is not too exciting or thrilling. For kids, this is awesome. This is very similar to the Orbitron in the Tomorrowland. The only difference is the design. The planets are replaced with the Dumbo. 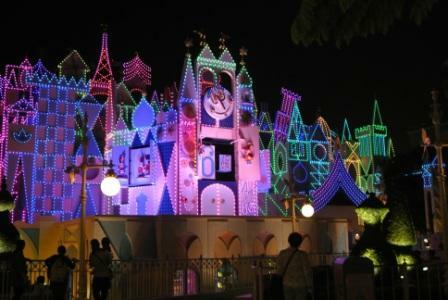 This is how it looks like in this Hong Kong Disneyland Fantasyland attraction. 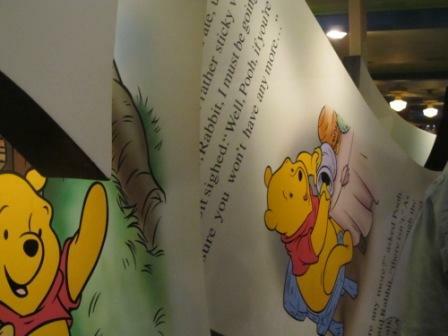 The "pages" of the storybook are horizontal, vertical, upside down and tilted. A cart goes around the story tale of Winnie the Pooh, Piglet, Tigger and other friends. When we got into the middle of the story, I felt like it was more like Alice in Wonderland, but replaced with Winnie the Pooh and his friends. Not only in the Hong Kond Disneyland Fantasyland, but also throughout the whole theme park, this is one of the most favorite attraction of mine. A 3D movie with all the famous Disney characters, such as Mickey Mouse, Donald Duck, Lion King, Aladdin, Nemo and so forth. Just before stepping into the theater, you will get a pair of glasses for the 3D effect. You need to return them when you leave. But it is not a must. You can feel the water splashing on you; smelling the champagne and everything look so real. My little one stretched out his arms throughout the movie and tried to grab the things in front of him. You can imagine how real the stuff look like. 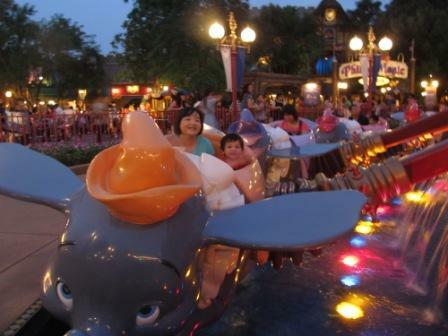 I believe he loved this the most among all Hong Kong Disneyland attractions. When Mickey threw the flute towards our way, he put up his arm trying to block it from hitting him. He did the same when Donald splashed the water on us. By the time we came out of the movie, he said, "Donald crazy". I think I like this attraction the MOST. By looking at the thrill and excitement my son got, it was PRICELESS. Although Mickey's PhilharMagic is my favorite, "It's a small world" always holds the dearest part of my heart. Could be the song...maybe what it shows in there. Everything is in harmony. Just like any "It's a small world" in other Disneylands. I still remember the one in Japan. As always, I love it. 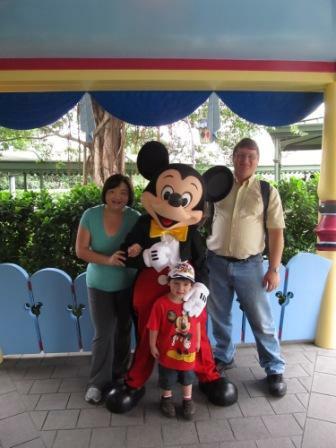 Check out our dining experience at Hong Kong Disneyland. Always try to squeeze at least 10 minutes to plan for your strategies here in this theme park. At the end, you will get more out of it. Where else did you check out in Hong Kong Disneyland Fantasyland? Share your experience with us.